Obituary for Gary Wayne Hunt | Swan Valley Funeral Services Ltd.
Gary Hunt, cherished son of the late George and Beth (Frazer) Hunt, and beloved brother of sisters Georgia Hunt, Donna Atkinson and the late Barbara Hunt, passed away on Friday, February 1, 2019. He was 64 years of age. Gary was born in Swan River, Manitoba on August 13, 1954 and lived in the valley his entire life. Because he was intellectually challenged (Down’s Syndrome), he never attended school, but his family devoted themselves to seeing that he had every opportunity to grow and thrive and live a full life within the confines of his abilities. Blessed with a winning smile and a joyful disposition, he welcomed every day, enjoying sports and work, family and friends. Because he was born into a rural area that initially offered very little to challenged individuals, his parents worked endlessly to open doors and possibilities for learning, working and contributing to society. Because of their efforts, the Association for Community Living was formed with George sitting on the first board of directors and for many years to come. As a youngster, Gary lived on the farm in Big Woody until the family moved into town. Through the years, while his dad lobbied for better living conditions and job opportunities for those who are challenged, his mother worked with Gary to meet his physical abilities, from him first sitting up, to walking, to riding a two-wheel bicycle. Every challenge was met with a smile and delight in his achievements. Gary eventually left home and moved into the Lions Manor where he met and made life long friends. As the Association grew and purchased homes and found apartments for their clients, Gary’s world was enriched once again as he took part in the programs that allowed him a life that provided him with individual rights and dignity. He was very proud of his work at the Westwood Inn, again making new friends and greeting the guests with his usual cheery smile. He was an ardent bowler and took great pleasure in showing off his scores to his friends. He was also an enthusiastic participant in the Special Olympics, looking forward to each event with his usual zest for life. He loved wrestling and often travelled to matches out of town. He was a passionate hockey fan and each year purchased a season ticket to the Stampeders’ games. He always sat behind his favourite team’s bench, making friends with the new and older players. He enjoyed travelling with his family, as well as the many bus trips he took with his pals. 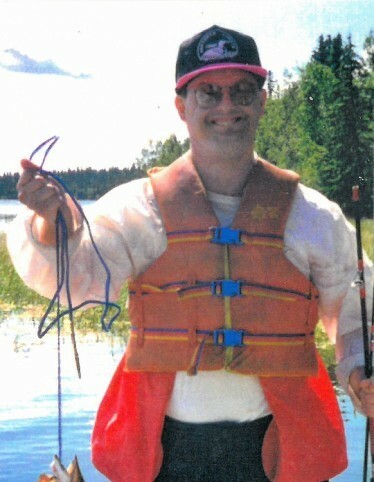 A favourite place was the cottage at Wellman Lake, but he also had a great time at fishing camps, again with his friends. Gary may have had some deficits and difficulties, but he always rose above them. He lived a full and happy life that most assuredly included his very favourite television programs and his passion for country music. Gary was predeceased by his parents, George and Beth, his sister Barbara, and his grandparents. He leaves to mourn his sisters, Donna Atkinson (Colin) and Georgia Hunt (Rick Bresky), many nieces and nephews, cousins, and his aunt, Doreen Lumax. He will be missed as well by the many friends he met throughout his life’s journey. A memorial service will be held on Friday, February 8, 2019 at 2:00 p.m. from St. Andrews United Church, Swan River with Rev. Kevin Sprong officiating. Interment following in Birchwood Cemetery. If friends so desire, donations in Gary’s memory may be made to the Association for Community Living, Box 2354, Swan River, Manitoba or the Community Foundation of Swan Valley, Box 1509, Swan River, Manitoba. Gary’s joy for life, his work ethic, his ability to meet each challenge with a smile, made its mark on those whose lives he touched and on the world in which he lived. Rest in Peace our Brother!